The Class of 2007 Ford Scholar from rural Tulelake, California, has a one-year Kirchner Food Fellowship through the Kirchner Group. 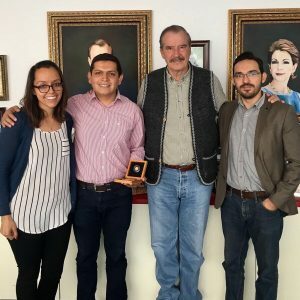 The Kirchner Food Fellows met with the former President of Mexico, Vicente Fox, to discuss their project and the search for an agro-tech startup to fund. From left: Rascon-Garcia, Alfredo Costilla Reyes, Vicente Fox, and Adrian Garcia Casarubias. Rascon-Garcia, 27, earned a Bachelor of Science Degree in animal science from California Polytechnic State University. 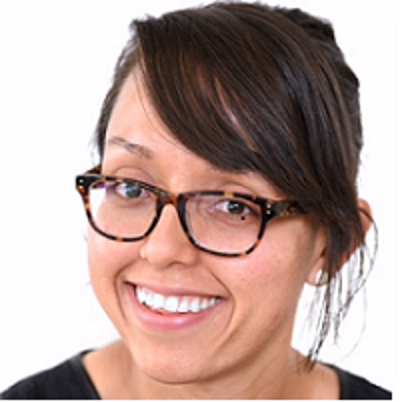 In May, she earned a Master’s in Development Practice from the University of Arizona, where she focused on epidemiology in Latin America. Her interest in animal health and agriculture was sparked from early exposures to farming in rural Mexico. She has volunteered in many countries and partnered with Panaftosa-Pan American Health Organization/World Health Organization, working with foot and mouth disease in Latin America for her master’s in development practice field practicum. Now, she’s working on a doctorate at the University of California Davis, studying livestock diseases. “I’m more interested in food security, which is where it all comes together,” Rascon-Garcia said. In August, she met with the two other 2017/18 Kirchner Food Fellowship recipients in Atlanta, Georgia, for the Kirchner Kick-Off Weekend, where they developed their investment mandate. One fellow is a PhD Electrical Engineering candidate at Texas A&M University, while the other is earning a doctorate in Plant Biotechnology in Mexico. The Kirchner Food Fellowship is an opportunity for an elite group of student leaders to be engaged in investment decisions on agriculture-oriented businesses with ground-breaking technologies which can provide long-term sustainable solutions, both environmentally and economically to global food security. The three fellows, with varying backgrounds, are collaborating to address the issue of food security. They are focusing on Mexico with the vision of expanding their findings to more countries in Latin America and beyond. Rascon-Garcia encourages those who may qualify to contact her. Once her fellowship concludes in late June, she will remain in Davis, California, to complete her doctorate. Rascon-Garcia says she wouldn’t be surprised if she pursues a post-doctorate.